Verona might be the birthplace of the most famous love story in literature, but the small village of Newbury, in the state of New Hampshire, the United States, is home to the most charming one of recent times. Although very few have heard of the story of the chicken farmer, it is New Hampshire’s favorite legend. The story begins about thirty years ago. At that time, there was a small white house by the side of Route 103, that passes through Newbury, with a chicken farm in the backyard. And on this farm lived a pretty girl of sixteen, named Gretchen Rule, who helped her family raise chickens. Gretchen had a secret lover, or perhaps two, but this story involves this particular boy who was too shy to come forward. So on one moonlit night, the boy took a paint brush and wrote, in eight-inch high letters, the message —"CHICKEN FARMER, I LOVE YOU", on a large piece of rock conveniently located near her house, just across the road. The next morning Gretchen saw the message, and guessed who wrote it, or so the boy hoped. What happened afterwards is a mystery, and is not part of the legend. Did Gretchen connect with the boy? Did they exchange letters? Did they stole kisses? Nobody knows. Gretchen Rule grew up and went away to college, but the message remained, now faded and obscured by brambles. The story could have ended there. But it didn't. 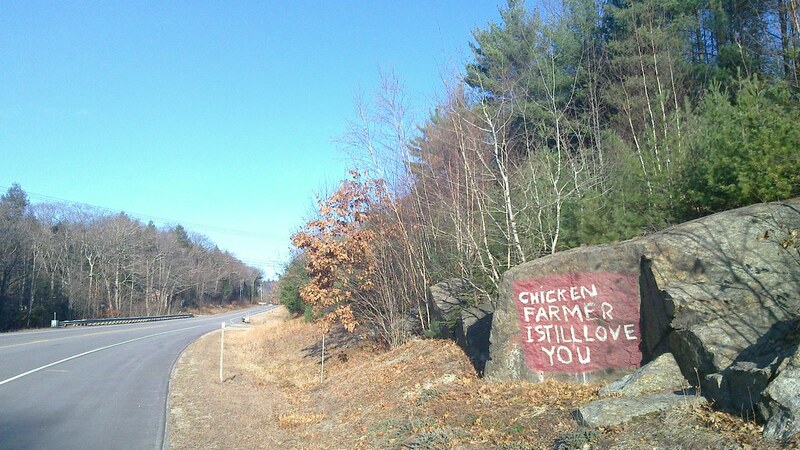 One day, years later, there was fresh paint on the rock, with a new message: "CHICKEN FARMER, I STILL LOVE YOU." At once, the rock became a landmark. Locals began to refer to it by name and smiled at the legend, while motorists passing it wondered what the message meant. Every few years, someone would cut away the brambles and freshen the letters with new paint, until one day in 1997, when a couple of workers from the Department of Transportation arrived and scrubbed away the love note. Somebody had called the city to complain about the graffiti. But the rock didn’t remain barren for too long. The stubborn message reappeared, as big and as bold as ever. This time, before the DoT could intervene, the residents of Newbury collected close to two hundred signatures and filed a petition to the department to leave the graffiti alone. The DoT acceded. Today, you can still see the “Chicken Farmer Rock” on the west side of Route 103 as you pass through the town.